Rockford Projects seeks innovative artworks for the inaugural artCURATED sector of ArtFTL 2019. 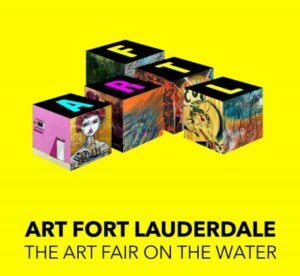 ArtFTL returns for the 3rd year as the premier art fair in Fort Lauderdale, drawing collectors during the height of the season in South Florida. Fort Lauderdale is known as the “Venice of America” due to its expansive and intricate canal system, and this 4-day curated art fair showcases the art within luxury waterfront properties. Attendees are transported via complimentary water taxi on an artistic journey along the famed Intracoastal waterways, in the heart of the arts and entertainment district. The ArtCURATED sector will encompass an entire property of 5,000 to 10,000 square feet, and feature 40+ artists, within six distinct, thematic exhibitions, under the direction of Lisa Rockford. Dates of Exhibition: January 24 – 27, 2019. ECSTASY: A Celebration of Color. Seeking Monochromatic artworks (made of a single/dominant, vivid color), or works that offer all colors in the rainbow, within one work. AURA: A celebration of Light. Seeking artworks that reference intense light, auras, or are made with neon, LEDs, florescent, incandescent lights, digital, or electric light components. NARCISSUS: Seeking art with mirrors, mirrored surfaces, and/or chrome, or polished stainless steel. ELEMENTAL: Earth and Water. Seeking artworks that emphasize earth or water, and/or the human connection to either. Artworks that reference ecological concerns, like sea level rise, and pollution, are of curatorial emphasis. MEMENTO MORI: Seeking artwork that references death, time, mortality, and transience. OMEGA: The absence of color. Seeking artworks that are nearly or completely white, yet offer exquisite surface quality, texture, or aesthetic. Please note: This Call for Art (and the themes & terms listed here) are specifically for the artCURATED sector of ArtFTL, and is a separate application (with a different fee structure) from the ArtINDIE Category on the ArtFTL website. If your work does not apply to the above themes, but are interested in participating, please apply here. Artists may submit up to 5 artworks, but will be limited to 3 artworks in the exhibit. (Artworks with multiple pieces may be considered one work). All submissions must be original work, created by the applicant, and without violation of copyrighted imagery. One of a kind works are encouraged, or very limited editions. (ie. Mass produced prints are not acceptable). Submitted images should accurately represent the actual, finished artwork, (not a modified or digital sketch). Any works that do not match the appearance of the submitted images may be disqualified at the discretion of the curator. Artworks cannot be larger than 6 feet in any direction. All artworks must be available for sale. Artwork will be installed by a professional installer, but works that are made up of more than 10 parts, or that cannot be installed without the assistance of the artist are discouraged. A jury fee of $25 is required with the application. Artists will be notified at the earliest possible date, or not later than December 21, 2018. If artwork is accepted, each artist will be required to pay $100 for participation. (We have made every effort to keep costs to artists low, as they are a fraction of the 100k production costs for the fair). Participating artists will be provided 4 complimentary passes to the fair, and VIP Vernissage invitation for the artist. Artists are not required to be present at the fair, but are encouraged to attend. Artists must deliver accepted artworks at their own cost, either by hand-delivering, or by shipping to the art handler, with a return shipping label. If artwork sells, the artwork will be shipped to the buyer, by a professional art handler, at no cost to the artist.